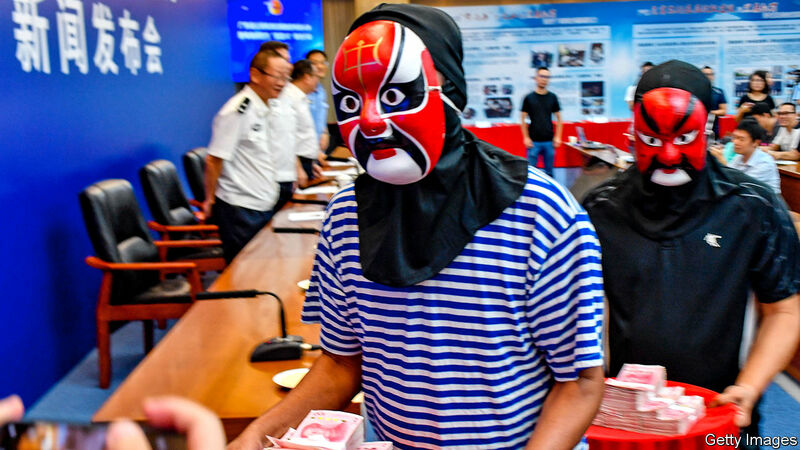 IN THEIR EFFORTS to eradicate criminal gangs, Chinese officials deploy a colourful vocabulary. Beijing is festooned with red banners urging citizens to “resolutely root out black and evil forces”. (In other countries this might be a job for police officers or exorcists.) Other banners mix metaphors. “Dig deep and thoroughly investigate the protective umbrellas” of such menaces, says one. In January 2018 China’s leader, Xi Jinping, launched a three-year campaign against organised crime. State media brim with reports of success. The authorities in Zhanjiang, a city in the southern province of Guangdong, claim to have dealt an effective blow to “vehicle tyrants” (taxi-business mafias), “sand tyrants” (gangs that control the sand-mining industry), “sea tyrants” (those involved in the seafood business) and “basket tyrants” (those engaged in the basket trade). So far more than 10,000 alleged gangsters have been brought to trial across the country. State media say police have smashed 6,000 gangs, with the help of citizens who are offered lavish rewards for leads (disguised recipients are pictured). A cartoon released by police in Zhaoqing, another city in Guangdong, gives an example. It shows what appears to be a Buddhist leader, judging by the decor and the kowtowing of his followers. He talks of establishing an “ideal country where we can do what we want”. Next he is shown leading protesters outside a government building. In the final scene he counts piles of banknotes. “The goal of an independent kingdom is getting ever closer,” he chortles, before police burst in. Other examples given by state media relate to political control in the countryside. They include clans that “lord over” rural areas (many villages are inhabited mainly by people of one surname) and the often-related issue of gangs that rig the vote in grassroots elections (their efforts sometimes proving more effective than the party’s). Perhaps not surprisingly, the gangs that help developers and officials to evict people from their homes are not mentioned as targets of the campaign. Rather, it is black and evil forces that “whip up unrest” during demolitions that are to be crushed. In other words, as the police are likely to interpret this, activists who try to organise resistance to the bulldozing of their communities. Also in the cross-hairs are the forces of evil that organise people to go in groups to submit petitions at government offices. Petitioning higher authorities for redress of local injustices is an ancient tradition in China that has continued under Communist rule. The party, however, is fearful of people with grievances gathering in public. The saohei campaign appears to offer the police an excuse to round up organisers and treat them as gangsters instead of merely bundling them off to detention centres to await deportation to their home towns. In January bosses at an industrial park in the coastal province of Fujian met to discuss two main topics: progress with saohei and how to control petitioners in order to prevent “sudden incidents” during the Chinese new-year holiday. In Tibet and the neighbouring region of Xinjiang, officials are using the saohei campaign to bolster their relentless efforts to crush unrest. Tibetans have been told to inform on dark and evil forces that “link up with the Dalai [Lama] clique”, that advocate the Dalai Lama’s “middle way” of compromise with China, that lurk in monasteries and use religion to stir up opposition to the party, or that encourage campaigning for the protection of the Tibetan language (see article). In Xinjiang officials say the main purpose of the saohei effort is to fight gangs related to the “three evil forces” of terrorism, extremism and separatism. Since he took over as China’s leader in 2012, Mr Xi has been waging a campaign against corruption as well as perceived political threats to the party in the form of independent lawyers, unauthorised religious activity and dissidents generally. It may seem surprising, then, that more than six years later—amid a climate of fear that pervades officialdom and stifles most of the party’s critics—the party still sees so many threats to its control. Yet it does. In January the country’s police chief, Zhao Kezhi, said the saohei campaign should be the “dragonhead”, ie, at the forefront, of this year’s security work. But the “focal point”, he said, should be “preventing colour revolutions”. Four days later, at a hastily convened meeting of senior officials from around the country, Mr Xi called for “high alert” against “black swan” or “grey rhino” events: crises resulting from unexpected incidents or obvious but neglected problems. As part of measures to ensure social stability, he said there should be “no let-up” in the saohei drive. The last time such a high-profile campaign was waged against gangs was a decade ago in the south-western region of Chongqing by its then leader, Bo Xilai. Mr Bo’s efforts earned him much approval locally, but were also widely criticised for their ruthlessness—critics said the campaign was used as a pretext to arrest businesspeople on trumped-up charges and seize their assets. Smashing black, as many commentators noted, turned into heida: “black [ways of] smashing [people]”. Mr Bo is now in prison for corruption, having lost a power struggle just before Mr Xi assumed power. But his methods remain in favour. A lawyer in Beijing says private businesspeople are just as worried by Mr Xi’s campaign as those in Chongqing were about Mr Bo’s. Lawyers, he says, have been ordered not to defend those arrested without official permission. Local government websites say prosecutors have been given quotas for handling cases related to the saohei campaign. Black and white are getting confused once again.